Every summer, usually in July, we have an all-day party with friends from Tom’s high school years. I make the appetizers and the main course, and everyone else brings salads, dessert, and drinks. We refer to this as our Summer Bash (as opposed to the Winter Bowl Party, which we’ll save for another day). We spend the day on the deck, in the hot tub, and if it’s seriously hot, in the river. At one memorable, particularly steamy Bash, we ended the party sitting in the river at the rapids, passing a bowl of chocolate-covered strawberries (our friend Marge’s essential contribution), and shouting helpful advice to passing canoeists. Heaven. We only wished we’d thought to bring a bottle of champagne into the water. I’m slowly edging the menu toward heavy appetizers, rather than a few munchies and a main course. The whole party is really geared toward all-day grazing instead of a main meal. This year we had our lightest entrée ever: grilled skewers of chicken and beef that guests could either eat atop a giant salad (courtesy of Jennifer) or eat in small rolls as mini sandwiches; grilled chicken or beef sliders, as it were. I made an assortment of sauces to accompany the skewers: teriyaki, ranch, wasabi cream, pesto, salsa, and guacamole. For appetizers, I made parmesan-pistachio shortbreads, caramelized onion palmiers (a future post), an assortment of crostini (recipes follow), a big bowl of watermelon chunks, and bowls of olives. Nick provided spiced nuts and a lovely Beaujolais. Our friend Traci made a gorgeous plate of bocatini (tiny balls of fresh mozzarella) with tomatoes, bell peppers and basil from their garden. We ended the day, as always, with Marge’s chocolate-covered strawberries. She promises to send me the recipe so I can post it. Meanwhile, here are the recipes for the crostini. The key to both of them is homemade ricotta. It provides a creamy, smooth base for the other flavors. I’d made it a few days before the party, along with a nice batch of pesto (the basil’s growing as fast as the weeds in my garden). I also toasted slices of prosciutto in the oven. The result is a sort of hammy bacon: crisp, meaty, and salty morsels of deliciousness. You can certainly use the prosciutto in its original form, but toasting intensifies the saltiness —a nice balance to the sweet peaches — and adds crunch. The Lucas-approved version of crostini were toasted slices of baguette with ricotta, pesto, and prosciutto bits — full-flavored and, with the creamy ricotta, deep green pesto and rosy prosciutto, very pretty. I want to eat these every single day until peach season is over. I’m willing to search for good baguettes, and drive the 45 minutes necessary to get real prosciutto; they’re that good. Heat the oven to 400 degrees F. Spread the prosciutto on a parchment-lined cookie sheet and toast for about 10 minutes, until the prosciutto is crisp and slightly browned. 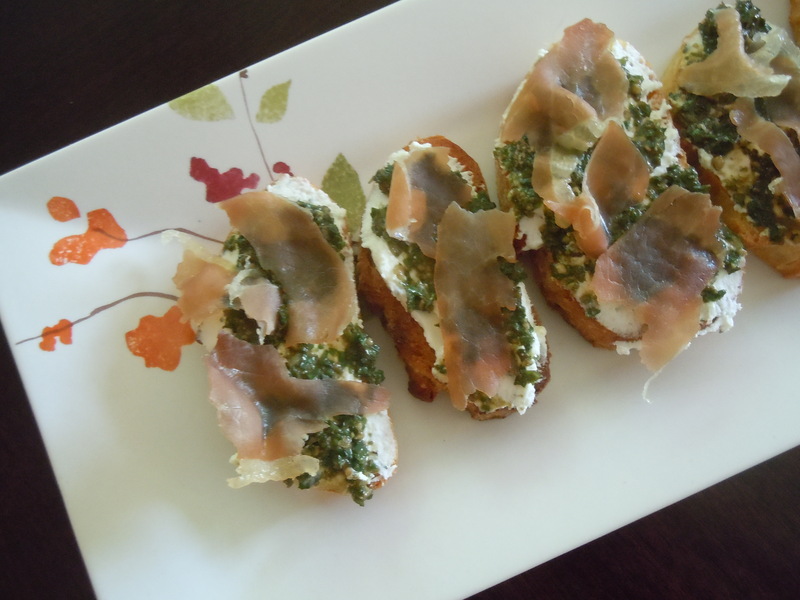 (If you’re making the pesto crostini as well, toast double the amount of prosciutto.) Remove to paper towels to cool. When they’re room temperature, break them into roughly 1-inch shards. Meanwhile, slice the baguette 1/2-inch thick. Brush lightly with olive oil and toast until golden. (I did this in my toaster oven; you could also just leave the oven at 400 degrees and toast the crostini on the same cookie sheet that you used for the prosciutto.) Cool to room temperature. Thinly slice the peach; no need to peel it. Spread each toasted baguette slice thickly with ricotta. Add a few shards of prosciutto, and top with a slice of peach. Serve at room temperature within a few hours of making them. Heat the oven to 400 degrees F. Spread the prosciutto on a parchment-lined cookie sheet and toast for about 10 minutes, until the prosciutto is crisp and slightly browned. 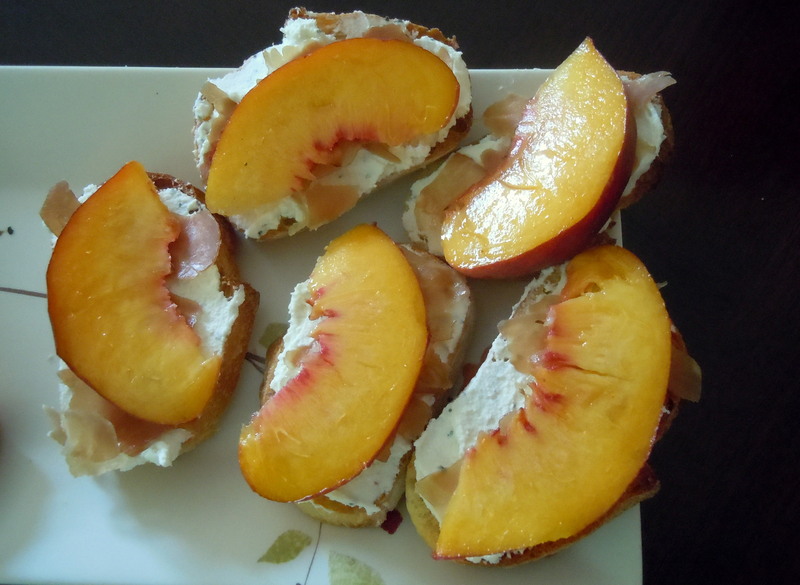 (If you’re making the peach crostini as well, toast double the amount of prosciutto.) Remove to paper towels to cool. When they’re room temperature, break them into roughly 1-inch shards. Meanwhile, slice the baguette 1/2-inch thick. Brush lightly with olive oil and toast until golden. (I did this in my toaster oven; you could also just leave the oven at 400 degrees and toast the crostini on the same cookie sheet that you used for the prosciutto.) Cool to room temperature. This entry was posted in appetizers and tagged baguette, basil, bread, peach, pesto, prosciutto, ricotta, toast. Bookmark the permalink. Thank you so much for posting to our Food Blog: Post of the Day contest. The recipes on your site look amazing! You’ve inspired me to try making my own ricotta at home. JoAnn, thanks right back at you for featuring my post. I’ll check in regularly to Food 4um. Let me know what you think of the ricotta!